By the time Dr. Jamel Santa Cruze Wright became the first chief diversity officer at Eureka College in 2014 — and eventually vice president for strategic and diversity initiatives — she had already had her sights set on becoming a college president for several years. What she didn’t expect was for her presidential dreams to materialize so quickly. “I will say that it happened a lot sooner than I anticipated,” Wright says. 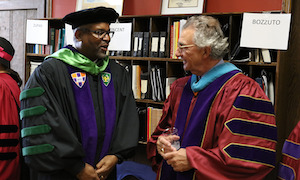 Hobart and William Smith Colleges President Gregory J. Vincent chats with Chair of the Board of Trustees Thomas S. Bozzuto. Wright essentially ascended directly from her role as a chief diversity officer at Eureka to the presidency at the small private college, initially on an interim basis in 2016 and later on a permanent basis earlier this year. Wright says the experience she garnered in her capacity as the school’s chief diversity officer played no small role in that move. “My role was bigger and more encompassing than just CDO,” Wright says, explaining that her role and responsibilities prior to becoming president included oversight for Title XI issues, communications and rolling out a new strategic plan. “All of those things, including the role of CDO, is what really made this happen,” Wright says of her presidency. Dr. Archie W. Ervin, president of the National Association of Diversity Officers in Higher Education, or NADOHE, says Wright’s trajectory to the presidency represents the emergence of a new and welcome trend in higher education, that is, colleges entrusting their presidencies to former chief diversity officers. Ervin trumpets the trend in the “President’s Message” on nadohe.org, writing that with the recent appointment of Wright as the first woman and first African American to lead Eureka College, there are now at least six former chief diversity officers who have risen to the CEO ranks. The other five he mentions are Dr. Juan S. Muñoz, president of University of Houston-Downtown; Dr. Shirley Collado, who is set to assume the presidency of Ithaca College next month; Dr. Gregory Vincent, president of Hobart and William Smith Colleges; Dr. Glen Jones, president of Henderson State University; and Dr. Rusty Barcelo, former president of Northern New Mexico College. Ervin says search firms now acknowledge that the CDO role today has been “complex and wide enough in higher education that it actually is great preparation” for the various issues that a college president will face, from financial issues to student and academic issues. “That’s absolutely great training ground for those who aspire to be presidents and CEOs, because that’s what they have to do,” Ervin says of the CDO experience. However, Monroe “Bud” Moseley, vice president and partner at Isaacson, Miller, an executive search firm that specializes in higher education, cautions against overstating the significance that prior experience as a CDO might play in the executive search process. “You have to be careful when people say you can move to president from the CDO role,” Moseley says, although he was not speaking in reference to Ervin’s or anyone’s particular remarks. “It’s not like the only thing you’ve done is been a CDO,” Moseley says. “Many of the people had been in student affairs,” he said, citing Dr. Juan Muñoz as an example. Indeed, before he became president at the University of Houston-Downtown, Dr. Muñoz had served as a senior vice president and vice provost for undergraduate education and student affairs at Texas Tech University. The position entailed supervision of more than 40 units and departments — including oversight of several academic degrees; the TTU Ethics Center; the Military Veterans Program Office; the Teaching, Learning and Professional Development Center; and the Office of Academic Engagement —according to his UHD biography. Moseley also noted that many of the former CDOs who are now presidents had substantial experience in academe. “If you had a richer record in the academy, then there’s no reason why a period of time as a CDO will distract search committees from considering you for a presidency,” Moseley says. “Why? Because we all know the relationships that CDOs help craft. Moseley says academic experience also goes a long way with the decision-makers and faculty members. “You really need to have some depth in the academic milieu to be credible to trustees, and certainly faculty, for the understanding that you can bring,” Moseley says. CDOs also tend to have experience helping presidents in times of crisis and other critical moments or periods on campus, says Ervin, the NADOHE leader. “This profession turns out to be excellent profession for training for presidencies because all of us have been in the fire with the presidents,” Ervin says. Being the go-to person during a critical time for a college is what Dr. Gregory Vincent, newly minted president (and a proud alumnus) at Hobart and William Smith Colleges, counts as one of the most salient preparatory experiences from his time as vice president for diversity and community engagement at the University of Texas at Austin. Vincent referred to the time as point-person for UT-Austin when the campus was embroiled in the Fisher v. UT Austin affirmative action case. “I showed that I could deal with and serve as a spokesperson for a campus on a critical issue,” Vincent says. But his position called for much more than dealing with the media when the national spotlight was on his campus. Ervin, of NADOHE, asserts that CDOs will be better prepared to deal with demographic shifts in the student bodies of the future. “People who haven’t learned how to successfully respond to that and lead on that are not gonna be the people who are gonna be the president in the future,” Ervin says. Presidents who are ill-equipped to deal with diversity, demographic shifts and racial incidents on campus risk being ousted from their posts, Ervin says, citing the 2015 protests that precipitated the ouster of the University of Missouri chancellor and system president. This article appeared in the November 2, 2017 issue of Diverse magazine.